“Any fool can write a love-gone-wrong song,” says the Boston Globe. “It takes a real genius to write a love-gone-right one. No urban songwriter does that better than Catie Curtis.” Love gone right – it’s a tricky subject. There’s a risk of sounding naïve or trite, but Catie somehow manages to balance hard-earned experience with wonder, melding catchy melodic hooks with heartfelt vocals. “If I don’t kiss you now, I will never sleep again,” she sings in “Kiss That Counted,” which won a Boston Music Award for Song of the Year. 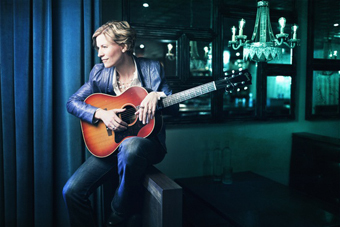 Since she first started touring in 1995, she’s recorded 11 albums, including her latest, Stretch Limousine on Fire, which Glide Magazine called “a high point in her long and established career.” Her original songs have been featured on several television shows, including Alias, Dawson's Creek, and Grey’s Anatomy. The New Yorker dubbed her “a folk-rock goddess.” Oh, and in 2010, she performed at the White House. Tonight she’s bringing her inspiring music, high energy, and sparkling sense of humor to the Freight. AG grew up in Miami, earned a degree in music production and engineering from the Berklee College of Music in Boston, and moved to Los Angeles to pursue a career that has so far produced five albums. Inspired by artists like Jewel and the Indigo Girls, she plays piano and guitar, and sings her own impassioned originals, which occupy the indie territory at the intersection of folk, rock, and pop.